We’d love your help. 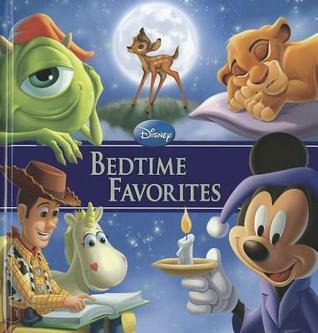 Let us know what’s wrong with this preview of Disney Bedtime Favorites by Annie Auerbach. Perfect for bedtime, the second edition of the popular Bedtime Favorites storybook collection has 19 stories to choose from. Updated story selections will feature characters from Finding Nemo, Cars 2, Toy Story 3, The Lion King, and more. Gilded pages and over 250 illustrations make this an ideal gift. To ask other readers questions about Disney Bedtime Favorites, please sign up. Cute stories involving Disney characters, each is rather short but complete and has pictures on most pages so if your kiddo has the need for picture in their stories this one should do the trick. Beautiful illustrations and cute stories! "Toy Story: The Big Campout gets 3 stars because I like how they make funny shadows. And they sing songs. The Lion King: Simba's Big Secret gets 1-2-3----5 stars!! Because I like how at the end they sleep together. Bambi: The Secret Adventure gets 5 stars! I like she makes friends on the way. Lilo & Stitch: Doggone It, Stitch! gets 5! Wait -- I would give it 6 stars!! I like the cute puppies! Mickey Mouse and the Pet Shop gets 5 stars because it's actually really funny so 5 stars. Sleeping Beauty: A Lullaby for Fairies: 5 stars! I like they are friends at the end. Monsters, Inc: The Spooky Sleepover gets has 5 stars. I like how the green one is scared. Cinderella: Bedtime for Gus -- 5 stars! I like how Gus is so cute! 101 Dalmations: Lucky's Busy Afternoon gets 0 stars. Lucky's a dumb dog! Peter Pan: To the Rescue gets 5 stars! I like how it's so funny! Finding Nemo: The Surprise Party gets 1 star. I hated it because the sharks are there and they will eat the fishes! That's why I gave it 1 star. Dumbo: A Brand New Act gets 2 stars because it was okay when they Dumbo fell over. It was funny but not that funny. Bunnies: A Day with Papa gets 5 stars. I like how Papa saves the bunny! Pinocchio: A Nose for Trouble gets 5 stars. I like how his nose gets so long! The Aristocats: The Coziest Cottage gets 0 stars. Pbbbbsssstt. It's not that funny and it doesn't even have kitties. Winnie the Pooh: Best-Friend Sleepover gets poo'd! hahaha Ummmm...hmmmm...4 stars! Because I liked how they were friends. Aladdin: Abu Monkeys Around gets 5 stars because I like how the monkey spreads bananas everywhere. First he eats bananas then he goes bananas. This book is filled with several well-known Disney stories and the characters all on "new" adventures. While not every story is great, the reader can pick and choose which stories to read to their child. My daughter looked forward to reading a new story or two each night. Illustrations were great, keeping her engaged as I read the story aloud. Some stories were heavy on the words but still managed to hold her attention. Makes me want to read some of the other editions! adorable my child loved reading these stories before bedtime and would even ask to read them randomly through out the day! I like how it uses the characters we know and love yet its new and different stories. A fun and well done foray in what I can only describe as a sort of Disney EU. I like that there were different stories with Disney characters. Kids would love it.